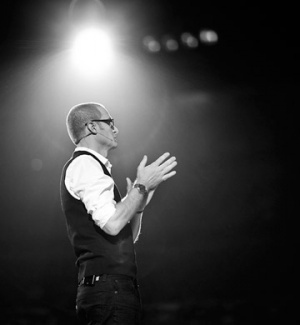 If you know anything about me at all, you know that I am kind of a Rob Bell fan. I've written about him on my blog from time to time. I confessed a man-crush here. The first time I heard Rob preach was in 2002 at a Youth Specialties conference. I sort of wept halfway through his sermon. I had never heard anyone preach the way Rob preaches. I still haven't. For the past ten-plus years, Rob has been the teaching pastor at Mars Hill church in Grand Rapids, Michigan. Rob made an announcement earlier this year that he would be leaving Mars Hill to pursue other kinds of ministry. And on Sunday he preached his last sermon to the congregation he founded. I am going to miss listening to the Mars Hill podcasts---at least the ones where Rob is preaching. I hope Rob's leaving doesn't translate into a diminished ministry for Mars Hill---although it's probably inevitable to some extent. I wanted to include some of the letter that Rob wrote to his congregation for his last sermon to them. He read/preached this on Sunday. If you've read Rob's books, or listened to him preach, you will understand why it's written the way it's written. who remember the old building, who braved that one? grace and peace to all of you on this day. To read the rest of Rob's sermon visit it at THIS LINK.